Another bicycle crash on Lower Lake Shore Drive has drawn attention to several persistent safety issues for people biking and walking on this congested stretch of the Lakefront Trail. Aaron Duncan, an IT engineer at WBEZ, was commuting home on his bicycle and traveling south on the path over the Chicago River when he saw heavy oncoming foot and bike traffic. While the Navy Pier Flyover is being built, people biking and walking on the trail are currently detoured to a shared sidewalk with no protective barrier next to high-speed vehicle traffic on the bridge. Duncan had slowed down amidst the traffic when a rented quadcycle hit one of the steel beams that supports the bridge and protrudes from the sidewalk. He collided with the quadcycle and was knocked into moving traffic on Lower Lake Shore Drive. He suffered a fractured wrist and his helmet cracked where his head hit the ground. Thankfully, Duncan was able to pick himself up and avoid more severe injury. As he was recovering, he reached out to Active Trans to share his story and strengthen our advocacy efforts around the project. Watch coverage of Duncan’s story from CBS Chicago. 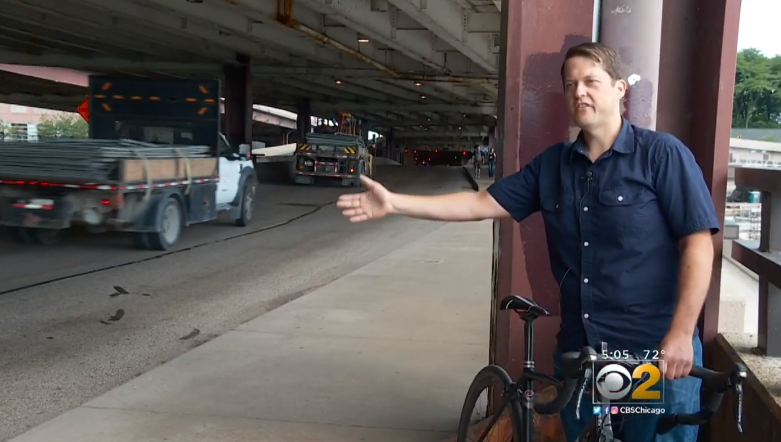 Active Trans is contacted frequently by trail users like Duncan who are concerned about the safety of the Navy Pier Flyover detour, especially the segment over the bridge, which is too narrow to accommodate the volume of trail users. Until the flyover is complete, we’ve called for the city to convert a travel lane nearest to the sidewalk to trail use and separate it from car traffic with physical barriers. Late last year Streetsblog Chicago reported the city plans to close the easternmost northbound lane of Lower LSD to accommodate foot and bike traffic from the trail during phase three of flyover construction – likely sometime next year. This lane closure should happen now to better protect people biking and walking on one of the busiest trails in the U.S. Active Trans has been urging the city and state leaders to come together to fully fund and build all three phases of the flyover and avoid any further delays. We’re glad to report that the project now appears to be fully funded and on track. The Chicago Department of Transportation (CDOT) confirmed to Active Trans that the project is fully funded and on track to meet the adjusted timeline. The procurement process for phase 3 has closed and a contract is expected to be awarded this summer. Work on phase 2 is progressing towards a usable segment by the end of the year over Illinois and Grand.